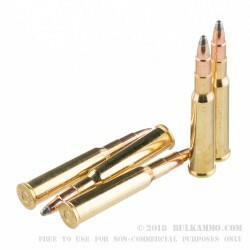 The Soft Point Cutting Edge Bullet is a projectile that seems old fashioned, but it is simply a mechanical version of the engineered bullets every other maker is touting as new technology. “If it isn’t broken don't fix it.” This is the case with the SPCE projectile from Sellier & Bellot that has been the ruin of many a trophy game animal. 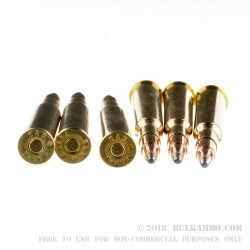 The sure performance of the rounds that offer this “Cutting Edge” bullet get to benefit from both of the nuanced meanings of the name. It is both “cutting edge”, in the sense that it is on the cutting edge of performance and it is “cutting edge” in that it has a mechanical action that cuts the edge of the mechanical bond as it does its job upon impact. The capability of the projectile to take game animals is very solid. The 7x57R is a classic European moderate and large game hunting cartridge and has the capability to perform on all game in North America, especially given the sure energy delivery and expansion of the oddly shaped, truncated profile SPCE soft point projectile. 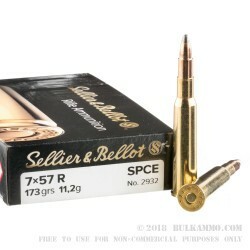 This is a 173 grain projectile with a very long; proven history of performance and the premium components that make up this load are value added, including the reloadable Boxer primed brass.